2017 will be a year of milestones at IPS Flow Systems as a number of our team celebrate 25 years service, starting with Andy Seymour who celebrated 25 years on the 5th May. Andy joined the company from Grahams Builders Merchants to work as part of the then extensive warehouse team of two! a far cry from todays team which now numbers thirteen and who do a fantastic job of getting customers orders out on time. 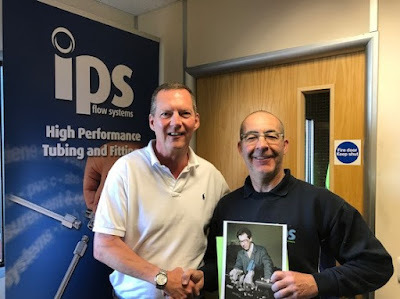 Andy was congratulated by David Stidolph, Operations Director who thanked him on behalf of the whole company for his dedication and service; while presenting him with a small token of our appreciation, (not the photo, which was a reminder of those hirsute days).